A unique Hand-crafted Moldavite pendant. 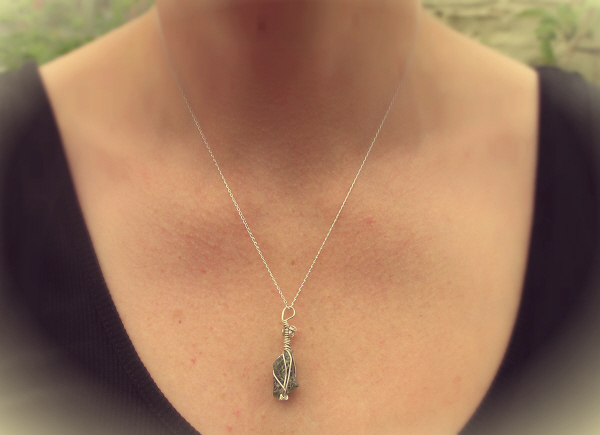 The Moldavite Crystal has been skilfully wire wrapped in sterling silver wire and strung from an 18 inch solid silver chain. This is a gorgeous piece of jewellery skilfully crafted from a piece of genuine Moldavite crystal encased in it's own sterling silver wire cage. 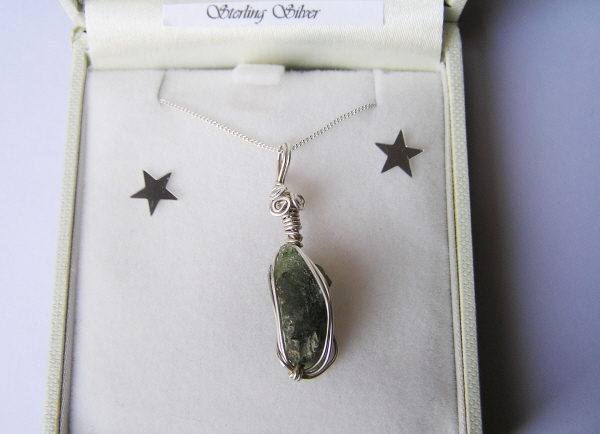 The Moldavite is set off with an intricate arrangement of coils and semi-precious stones and then hung from an 18 inch solid sterling silver curb chain and boxed in a lovely padded velvet lined jewellery box. Moldavite is only found in the Moldau River area in the area of the world formerly called Czechoslovakia. It fell to earth 15 million years ago. Moldavite is very scarce and is truly prized by all who are fortunate to own a piece. Made to order so may vary slightly from the one shown. You will also receive a superb signed certificate of authenticity complete with holographic serial number. This. along with the A4 meteorite information sheet I will also send you make up a fantastic gift package to give a fan of unusual jewellery or astronomy.